I am SO excited! 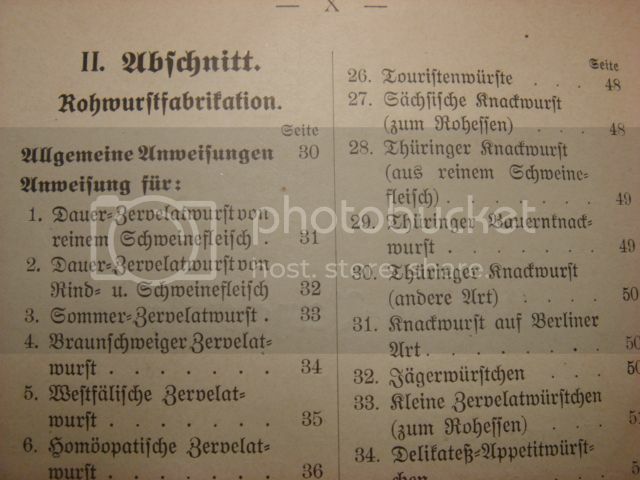 I just used some Christmas money to buy myself a 4th edition copy of Die Fabrikation feiner Fleisch- und Wurstwaren by Fleischmeister Hermann Koch. This is probably the most comprehensive collection of German meat and sausage recipes out there. The current edition contains over 1200 recipes and variations. The version I got is pre-Depression, pre-Nazi, pre-WWII. I'm not sure, but it may also be pre-WWI. It doesn't contain as many recipes as the more current editions, of course - it won't contain a recipe for currywurst, for instance - but what it does contain will be Old School. Pics to follow! vagreys wrote: The version I got is pre-Depression, pre-Nazi, pre-WWII. I'm not sure, but it may also be pre-WWI. It doesn't contain as many recipes as the more current editions, of course - it won't contain a recipe for currywurst, for instance - but what it does contain will be Old School. Pics to follow! 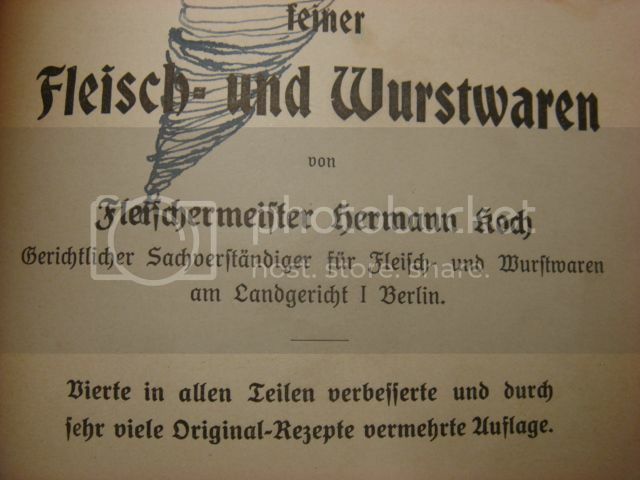 Yes, that looks like a tornado doodled on the title page. Apparently, above it, is the name of the owner from whose estate it was sold. Wow! 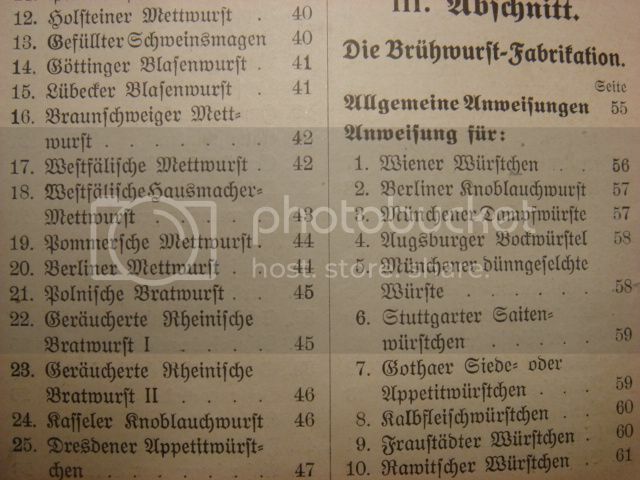 Is there a particular sausage type you are researching or are you mainly focusing on the historical perspective? I'd love to see any recipes you work out. 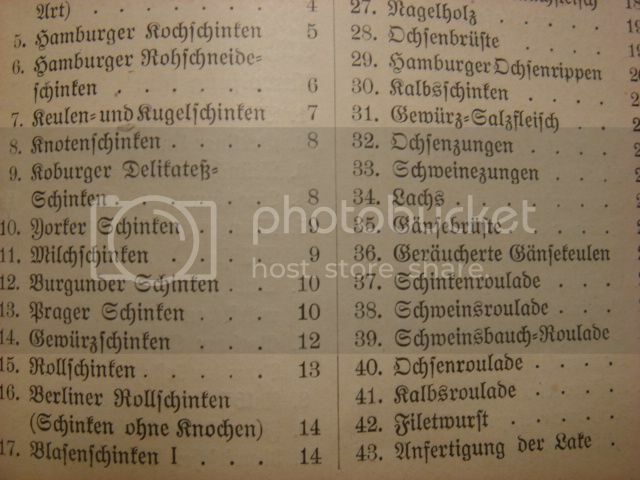 Trying to find non-Americanized German sausage recipes that weren't altered as a result of Nazi politics, WWII's thorough destruction of Germany, the subsequent isolation of East Germany, and Communist politics. I wanted a comprehensive source that would provide regional variations on common sausages, as well as some of the uncommon ones. For myself, I'm looking primarily at pork sausages, since I can't eat beef, but there may be some that are just too tempting to pass up, and I may be subbing bison for beef. From there, I can work out substitutions. ETA: I'll be sharing recipes, of course. 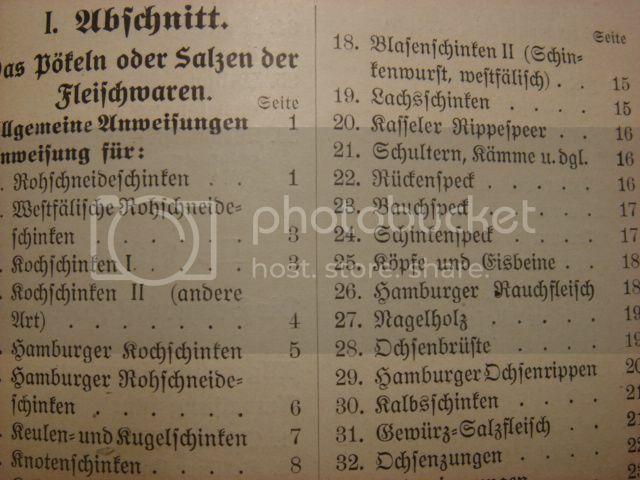 Any clue about sausages in the Palatinate up to about 1733? My maternal grandmother's family came from the Palatinate in 1733 aboard an Irish ship and settled in Northern New Jersey. I've always been curious about sausages from that area at that time but have never been able to find much information. Saumagen AKA Hog Maw or stuffed pig's stomach seems to be the signature dish from the area. FWIW, many Amish and Mennonites came from the Palatinate region. Most of my study (and source material) is from much earlier than that, or modern. I haven't spent much time on 18th C. foods. I'm sure there is some documentation, but it would likely be in housebooks. 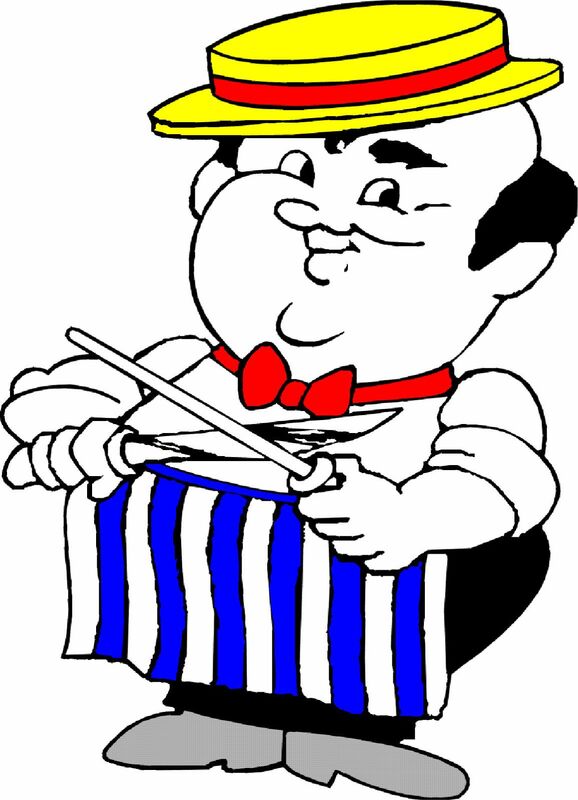 Traditions in the butchers' guilds of the 18th C were primarily taught as oral tradition and by demonstration. Written formulas were few and closely held. Just what I needed, another rare specialty cookbook I feel I must have! My wife is not amused. A friend of mine is repairing the spine leather. His specialty turns out to be bookbinding and book repair. 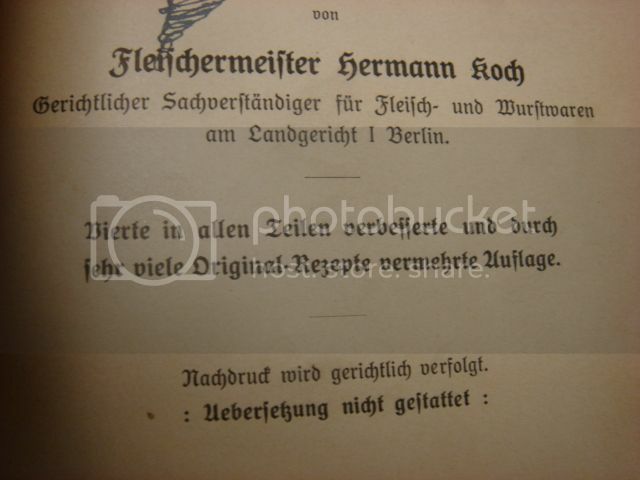 A little internet sleuthing turned up a 5th edition copy for sale with an estimated publish date of 1910-1919 for $75 USD. Looks to be a steal but I don't have the cash to spend right now so I'll cross my fingers for another copy to become available down the road. Looks like an awesome title, I'd love to see more pics! Mark did a great job on preserving the spine leather, reinforcing the spine, and securing the spine leather to the bolstered spine. The book is back to usable form without having to worry about it falling apart. He did it for free, for the opportunity to practice restoration on a book that old. I couldn't be more pleased or grateful. Care to post some before and after pics? I got to this web-site (http://www.uni-giessen.de/gloning/tx/sawe.htm) by looking up the name "Sabina Welserin" that was attached to an old recipe someone posted on one of these threads. Apparently it's from 1553, so that's definitely pre-whatever. 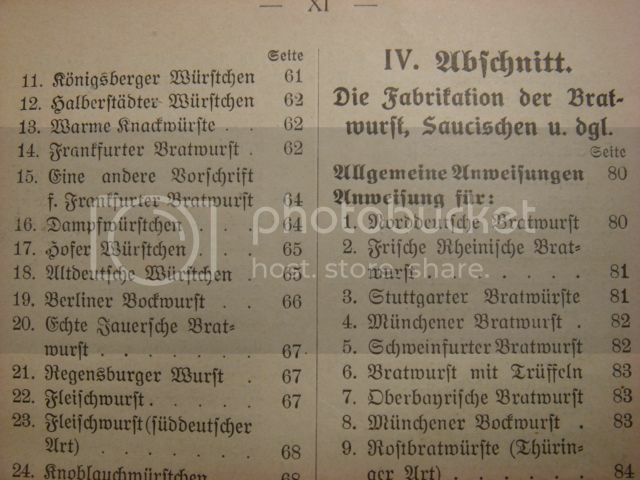 It's in "frühneuhochdeutschen" which I believe means early new high German. The challenges in reading this are that the spellings are not modern (e.g. wirst used instead of wurst) and often not consistent (prattwirst and brattwirst in the same recipe, both wirst and wúrst.used). My wife, who's first language is German, read a bit and then stopped in disgust. The difficulties are even worse for English speakers. I speak a little German so I understood some of it, but I like European languages and I'm pretty persistent. On the other hand... it's free. In my thread on medieval German sausage recipes, I've included the Sabina Welserin bratwurst recipe. Incidentally, it has become a customer favorite. I offer it as all-pork, 80/20 pork and bacon, and 40/40/20 pork/bison/bacon. The seasonings are salt, pepper, marjoram and sage. It's a great recipe. The Welserin manuscript is one of the most accessible German manuscripts from the Renaissance, and easier to deal with than some of the others, if that tells you anything. I just saw the request for before and after pics of the spine restoration. Unfortunately, I wasn't thinking about documenting the process, so I didn't have 'before' pics, which kind of renders 'after' pics less meaningful. There was actually very little leather lost over time, so the spine looks almost as if there had been no deterioration. A German lady, here in BC, has offered to help with some translation, and I will post as I can. I intend to take advantage of her offer for the two remaining months of my visit, and have had the book shipped from home. As some of you know, by now, I usually have a lot of irons in the fire at any given time.